Auckland boatbuilder Richard Edlin breathes new life into old bones with the restoration of a Pelin Empress – previously consigned to an uncertain future – and in doing so, puts forward a compelling case for buying old over new. Steve Raea reports. A champion of the working classes, iconic kiwi boat designer Frank Pelin's impact on the New Zealand boating landscape has been immense. A firm believer in the kiwi 'can-do' attitude, Pelin's design career has always focused on helping ordinary New Zealand families achieve boat ownership – and with it a slice of New Zealand's unique boating lifestyle. A prolific draftsman, Pelin's Auckland design office has turned out more than 160 sets of plans for a diverse range of vessels, from yachts and catamarans to dinghies and runabouts and planing and semi-displacement launches, for which he is best known. Like fellow New Zealand designers Richard Hartley and John Spencer, Pelin was an advocate for amateur boatbuilding and believed that with a few basic skills and a modest budget, ordinary kiwis could knock up a boat at home. Backyard boatbuilding was at its peak in the Muldoon years and it was not unusual to find two or even three Pelins and a ferro-cement yacht under various stages of construction on any given suburban street. These were social times, too: backyard boatbuilding was good fun and many an impromptu neighbourhood party would spill out from under army surplus tarpaulins and rickety sheds at the end of a Saturday's boatbuilding. The seven-day working week and the solid-state computer chip has all but done for backyard kiwi ingenuity, but the legacy of those that grasped the challenge and completed home-built boats is still there for all to see. Built largely from plywood and glue, age and neglect have taken their toll on many of these boats but there are still sound vessels to be found, sitting on dilapidated trailers in boatyards and under cover in chook houses and farm sheds up and down the country. Tired but complete, they have little monetary value as they sit but they're fast becoming classics. And with a little patience and time, they can be saved and put back into family service for considerably less than the cost of today's modern equivalent. One man who knows all about this is Auckland yacht designer and wooden boatbuilder Richard Edlin, who has recently completed a substantial rebuild and refit of an original home-built Pelin Empress 24. The Empress was one of Pelin's most enduring designs and the boats continue to pop up frequently on the second-hand market – albeit in various guises and states of repair, given that most were amateur-built. Edlin's association with the Empress was not planned, nor particularly welcome, when it first turned up at his Matakohe property on the banks of the Kaipara, for what its owner loosely described as 'minor repairs'. Minor repairs developed into fairly major repairs and the owner was grateful to relinquish the boat to Edlin and recover his investment. Before long, Edlin was fully immersed in a restoration project that would soak up 1700 hours' labour over a three-year period. Applying his designer-eye, Edlin's vision for the Empress was a thorough modernisation of the interior and transom, without overly compromising the Empress' distinctive, classic lines. The challenge was how best to bring the various components together. Edlin says that at 24 feet, there simply wasn't enough boat to achieve the level of comfort he sought and says the only sensible solution was to cut away the transom and extend it by four feet. A patch of rot well aft made that call a little easier. 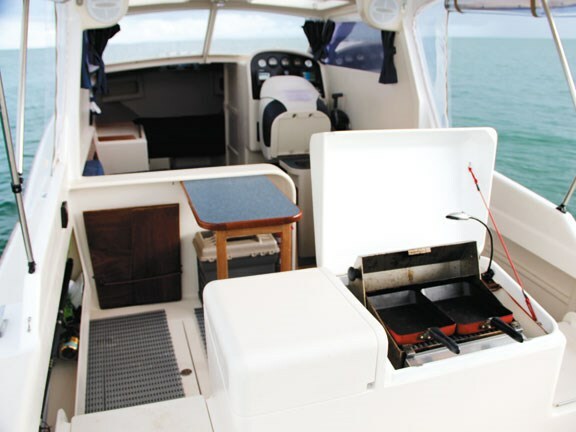 The transom extension also created a useful platform upon which to mount an island-style walk-through, with new transom lockers enclosing the boat's barbecue and live-bait tank, while providing a base on which to mount a permanent bait board. Sensitive to the boat's proportions and the Kaipara's propensity to cut up rough, Edlin further increased the boat's topside height by introducing a variable bulwark which terminates at the forward end of cockpit. This is highly effective from a seagoing perspective and reinforces the boat's heritage, with a pronounced, classic sheer line. Edlin's next major task was building and fitting a new self-draining anchor locker into the bow. The original anchor locker drained directly into the bilge and this, he says, has been the ruin of many a good Pelin. While working on the deck, Edlin chose to introduce a more aesthetically-pleasing cabin trunk, increasing the aft rake of the trunk and better matching the angle of the new windscreen and stylish cabin-top eyebrow. His plans for the interior necessitated gutting 90 percent of the existing fit-out to gain access to the entire forward bilge, which he strengthened significantly with a GRP foam core sandwich laid between the existing stringers and frames. With the interior removed, Edlin built moulds for what would be the boat's new GRP/ply underfloor fuel and water tank. Sensitive to his environment, Edlin went even further, fitting a 120-litre holding tank located discretely beneath forward V-berth. But nothing is ever easy with boats and this, in turn, required Edlin to raise the forward bunk height 200mm. The silver lining, he says, is a significant increase in bunk width. Not content, Edlin further removed the cabin bulkhead frame to gain the full measure of the cabin and with it a very generous double berth. The helm station was similarly ripped out and replaced with a modern custom-built ply/GRP unit, with inset carbon-fibre facia to accommodate a new suite of electronics and instrument cluster for the replacement V6 250hp four-stroke Yamaha now hanging off the transom. As the boat now sits on its trailer, Edlin estimates his investment at about $170,000, including his time. However, he is quick to point out that this includes $15k for the replacement Yamaha, $15k for an upgraded second-hand Hosking trailer and his initial $15k purchase of the boat. Add to this the cost of the new electronics, canvas covers and clears, new squabs throughout and other various sundries and the value of the upgrade, in terms of labour and materials, is considerably less. He points out, too, that a lot of time went into making moulds for the new tanks and the many aesthetic touches (which are optional) and add little to the boat's practicality or on-the-water performance. There's no doubt, he says, that he's gone a bit overboard but much of the rebuild was completed after hours and between other jobs. "There are no regrets on my side. Sure, the boat took on a life of its own but I have no problem justifying this, to the extent that we're committed to owning and using it as our family boat for the next five years. It does everything we want it to do and it does it well. I feel reasonably comfortable that we're still on the right side of the ledger when I see what people are paying for similar-sized new trailer boats," Edlin remarks. He points out that the renovation was completed as and when he could afford and says this is something that has to be considered when weighing up the benefits of purchasing new or buying second-hand with a view to a refit. 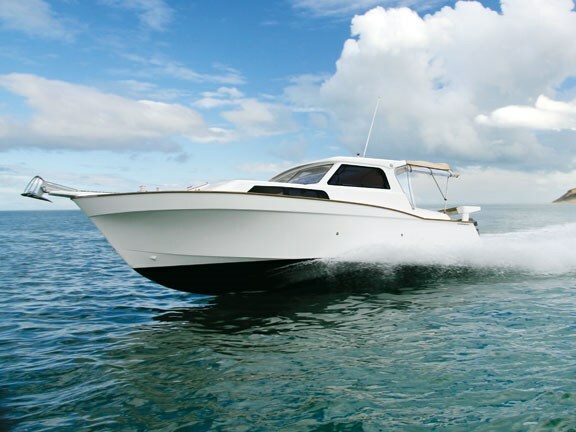 "If financing a new boat, the ticket price is not a true reflection of cost. Finance comes at a price and if that new boat has to be sold then depreciation losses have to be factored in. 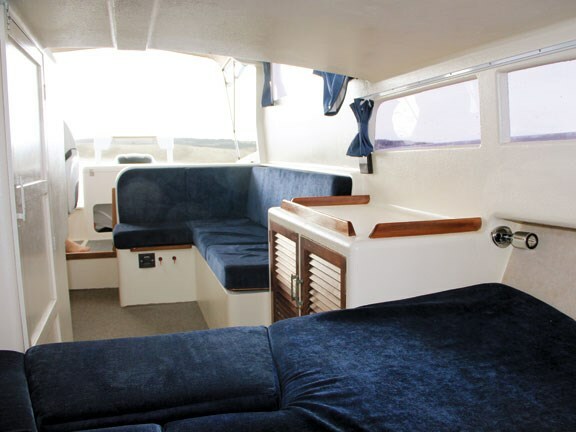 The alternative – purchasing second-hand and refitting as you can afford – is less likely to cause financial stress, and if a staged refit is managed properly, it shouldn't prevent you from using the boat during summer and refitting in winter," he adds. Edlin says he's happy to discuss the refit process and work with potential clients interested in exploring the refit path. "It's no secret that custom wooden boatbuilding in New Zealand is in a parlous state and boatbuilders have had to diversify. I've progressively set my business up for refit work and I encourage owners to be a part of that process," he comments. With his facilities geared towards new boat builds, as well as refits and repairs, he is also in the throes of further extending his boatbuilding workshop to provide basic accommodation, whereby boat owners can comfortably stay on his property and work alongside him on their boat. "It's a little novel, perhaps, but it's another way that owners can keep costs affordable and be a part of the process," he says. Busy designing two new launches on his drawing board, Edlin also has the capacity to launch and retrieve boats up to about 45 feet from the Kaipara Harbour, directly from his own boatyard. He acknowledges that timber boats need careful assessment before launching into a refit and says prospective buyers should have an invasive survey carried out by an experienced surveyor. "It's not enough to get your boatbuilder mate to check it out for you. As boatbuilders, we know how to repair rot but a surveyor worth his salt knows where to find it. Cutting corners for the sake of a surveyor's fee is false economy." The value of the Empress's extended transom platform is obvious at the outset and not only makes boarding easy but adds tremendous volume to the cockpit and increases no end the boat's ability as a fishing platform. Edlin enjoys dipping a line as much as anyone and fishing is high on his list of priorities, but with a partner and young daughter to accommodate, there's a limit to what works on a family-orientated boat. To this end, he's avoided the temptation to fit a game chair and live-bait tank and has opted instead to use most available locker space for general family stowage. However, there is a wash-down facility and the provision to turn one of the aft lockers into a bait tank – as and when required. The open nature of the transom is also ideal for diving and swimming but creates a potential liability at sea with the kids. Edlin has thought this through, building a simple hatch board which slides into cleats to secure the cabin from the cockpit. Moving forward and to starboard is a small galley unit, with a two-burner hob and grill, onto which is mounted an LPG water heater. It supplies hot water on demand to the sink unit hidden under the helmsman's seat and a handheld shower tucked into the cockpit. Opposite is an L-shaped settee, which converts easily into a cosy double with the back squab dropped into cleats. Forward and down, the enclosed head is to starboard and cupboard storage opposite. 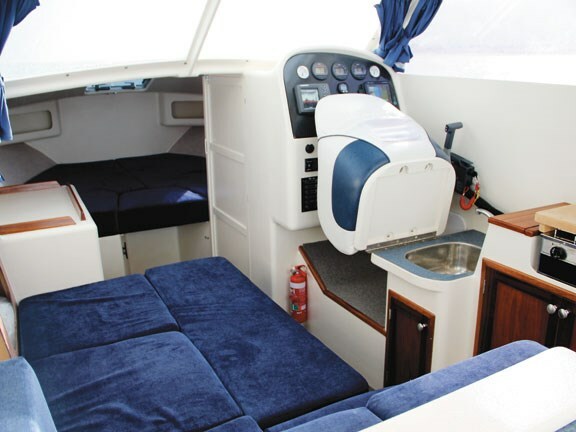 The V-berth can be arranged to provide two single berths or a large, comfortable double. The boat is light and airy, with twin overhead opening hatches in the hardtop and large windscreen and cabin windows. The addition of a canvas bimini and clears allows the boat to be fully enclosed, while retaining full use of all available space. The finish is smart; the layout practical and inviting. And with 540 litres of fuel and 210 litres of water, the boat is well set-up for overnighting and weekend cruising. Edlin says he and partner Trudy and their two-and-a-half-year-old daughter, Alysha, spent a very enjoyable week cruising the Northland coast at Christmas. 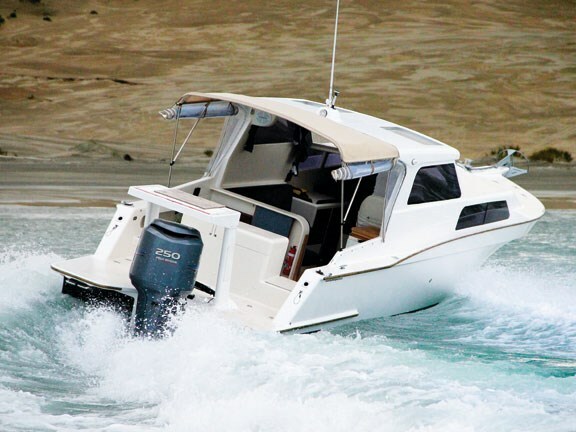 They felt perfectly comfortable and secure with the boat's performance in a variety of conditions. "Adding a raised bulwark has reduced the risk of shipping water when punching into a sea and the new anchor locker has effectively added a lot more strength to the foredeck. While we wouldn't choose to get caught out in a blow, I'm confident we could weather one and get home safely," Edlin confirms. Adding four feet to the transom of the Empress was always going to have an impact on hull weight, as too was foam-filling the bilge, but overall weight is not excessive. At 2300kg on trailer, it is, says Edlin, about the same weight of an equivalent alloy boat and lighter than a solid GRP boat. Additional length also requires more horsepower but the 250hp Yamaha four-stroke replacement for the original 175hp Evinrude delivers sufficient power and torque to lift the boat onto the plane quickly and efficiently. While no race boat, the Empress is no slouch, either, and will pull 34 knots trimmed out at wide open throttle. It cruises very nicely at 25 knots, with the tachometer sitting on 4500rpm and is relatively frugal, sipping one litre of fuel for every 1.3km travelled. Launching from Tinopai, we nosed the boat out towards 'Chicken' (Pouto) Point and the Kaipara Heads, experiencing a variety of conditions en route – from flat running on a slight sea to bouncing across a short wind-against-tide chop. It was going to take more than this to rattle the Pelin but we experienced enough lift to conclude that the foam-filled bilge has had a notable effect on dampening slap on the timber hull. Pelin hulls are generally considered to be good all-rounders and this is a fair summation of the Empress. From a passenger's perspective, visibility is limited to the rear of the boat, unless you're happy to stand alongside the helmsman. However, the driver has excellent vision, with the option of popping his head through the overhead hatch. From a purely cruising viewpoint, the Empress is roomy and comfortable, with seamless flow between the cockpit and saloon. Moving forward on deck is challenging without hand or bow rails, but these are on the cards. Edlin's enthusiasm for the boat is infectious and given his time on the water with it, he's entitled to conclude that the Empress is well mannered and has no obvious vices in terms of its seagoing abilities. "No boat is infallible in the wrong hands but with good seamanship and boat handling, the Empress will cope with most conditions. We've seen plenty of action on the Kaipara but we've always got ourselves home without incident. "The only shortcoming I can see with the original Empress design is the relatively low freeboard at the bow which could be troublesome if punching into a big sea. That's been taken care of with the raised bulwarks and it is a very definite improvement," he adds. In summary, Edlin has clearly and cleverly transformed a 70s vintage boat into modern and contemporary weekend cruiser, while remaining loyal to the designer's vision. By combining modern materials and epoxy coatings, he's breathed new life into an old hull and given this particular Empress a new lease on life. Moreover, he has shown us an alternative pathway to securing a boat with modern appointments and features, without having to mortgage the house. While it's a pathway many might choose to ignore, it nevertheless broadens our options and provides some serious food for thought.